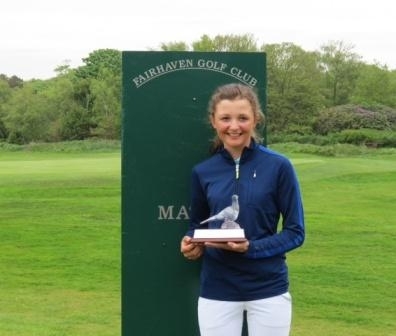 Sophie Lamb has successfully defended her trophy this weekend at Fairhaven. The event is limited to 120 boys and 24 girls (the highest handicap was 2) who come from Europe to compete. The top 25% of boys (30) and girls (6) and ties after 36 holes make the final 36 holes. Sophie won the girls’ trophy with a record low score of nine-under par 291, was third overall in the mixed field and has now come down to +1.9 handicap. She was involved in a tense battle with good friend and fellow Lancashire player Hollie Muse. At the halfway stage Hollie held a one shot lead, but Sophie returned a four-under par, bogey-free third round of 71, to move a stroke ahead with 18 holes left to play. Sophie saved her best to last, returning a closing five-under 70 which included seven birdies. She had extended her lead to four shots at the turn and eventually won the girls’ trophy by six shots.